At St. John’s we focus on academic achievement in the areas of Math, Science, Language Arts, Social Studies, Art, Physical Education and Music. Creating very diverse and well rounded students. St. John the Evangelist School is centered on the teachings of Jesus Christ. These teachings can be seen throughout the school and reinforced daily through our Catholic Identity. We begin and end each day in prayer and each Monday we are reminded of our Mission. It is evident in all that we do that St. Johns’ learners and teachers are answering the invitation to become citizen-disciples of Jesus Christ. Click to review or download Religion standards by grade. 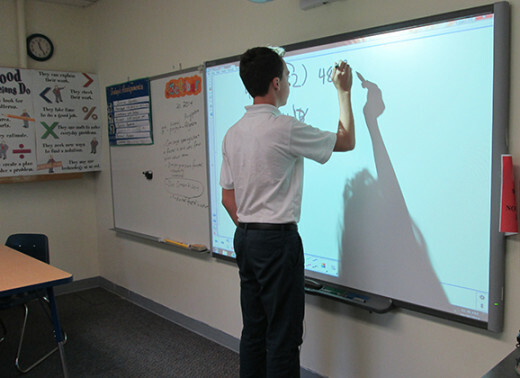 Here at St. John’s school the Math curriculum includes number and operation, geometry, measurement, data analysis and probability, and algebra. Beginning in Pre-K and Kindergarten, students are taught using a developmentally appropriate approach to ensure that students can identify numbers and their value. Beginning in 1st grade standardized test scores are used to lead instruction to meet individual student need and understanding. 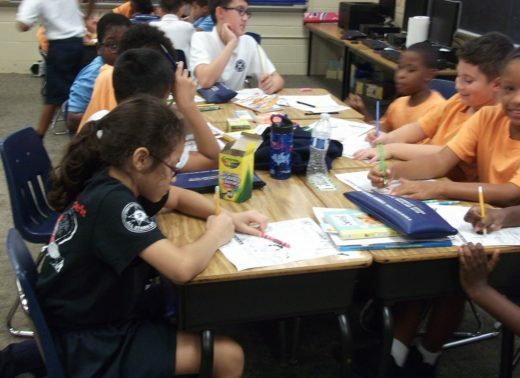 Our Middle School Math program provides daily small group instruction to provide students with one on one instruction. On average these classes have a 10:1 student to teacher ratio. We strive to ensure that students have a solid mathematical foundation and are well prepared for High School. Click to review or download Math standards by grade. The Science curriculum in grades PreK-8th is entirely hands-on and discovery based. Students learn through doing and experimenting with the world around them. Middle School Science offers small group instruction and several STEM projects each year. We also work collaboratively with a science coach sponsored through the Chemical Society of America. Click to review or download Science standards by grade. Beginning in Pre-K and Kindergarten the students are taught using a developmentally appropriate approach to ensure they can identify letters and their sounds to create emerging readers. This continues in 1st and 2nd grades and incorporates blends, sight words, and reading fluency to ensure a strong phonetic foundation. Throughout grades 3rd through 8th these skills are reinforced and continually practiced through whole group reading, levelled readers, and interest inventory reading to ensure that all students are challenged at his or her ability level. Each class begins the day with a daily oral language skill review to reinforce the grammar standards. Every class also participates in a weekly Writer’s Workshop to establish effective writing skills and strategies. Click to review or download Language Arts standards by grade. The Social Studies curriculum begins in the primary grades with students gaining an understanding of community and their place in it. Throughout the grades this is expanded to include learning about past civilizations, governments, and significant historical events. Click to review or download Social Studies standards by grade. Visual Arts is offered in grades Pre-K through 8th once a week with the class split between art and technology so that the class size is only half of the students. Students engage in a variety of art activities using different media and learn about different artists and art movements. The art history component roughly parallels the social studies time period each grade studies. Click to review or download Art standards by grade. Physical education is offered to Pre K through 5th Grade twice a week, and 6th – 8th once a week. Pre K through 3rd grade participates in activities that improve their locomotor skills and sport safety. 4th and 5th practice the skills necessary to participate in a variety of different sports and focus on why fitness is important. The 6th – 8th grade work as teams to play a variety of different sports and also complete a physical fitness test once a quarter. All classes are put into 4 different teams to work together to receive reward points by showing readiness to learn, sportsmanship to all, respect to others, and success in activities. Reward points get the students lots of prizes throughout the quarters! Click to review or download Physical Education standards by grade. Here at St. John’s the Foreign Language offered is Spanish. Spanish is offered in grades Pre-K through 8th twice a week. It provides students an introduction to a foreign language and an understanding of the Hispanic culture. Our Spanish teacher uses a variety of strategies to help students be able to understand and hold a conversation in Spanish. Click to review or download Foreign Language standards by grade. Click to review or download Music standards by grade.